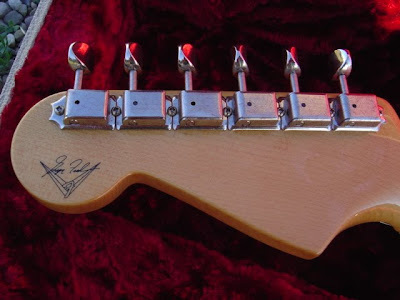 Here's a Strat Satan himself could own! Somehow the red plush contrast in the center photo brought Harvey Keitel's character in Little Nicky to mind. All he needed was this Strat, all up in that big throne-- that is, before his appendages started falling off. So anyway, about the Strat. 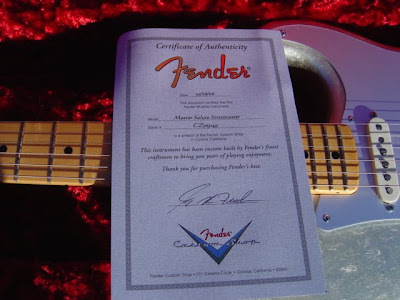 New condition and built by Greg Fessler in Jan. '06, this Custom Shop Master Salute is on the block at eBay Store FLIGHT 101 , a 100% rated Power Seller with a few other choice listings. 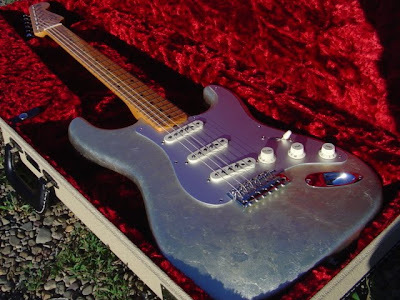 The Fessler Strat listing is loaded with plenty of hellacious pics, specs and details. If you got the devil's cash, don't wait till your stuff is fallin' off! Isn't he doin' that Spock thing? ?